Shaft Type: Single Side Flat Shaft Diameter: 1/2"
Note: Always check the blower wheel on your blower assembly. Bad or unbalanced blower wheels can cause premature motor failure due to vibration. If you are not sure what blower wheel fits your blower assembly, call us at 734-326-3900. To prevent premature motor failure, it is highly recommended you change your capacitor along with your motor. Capacitors out of tolerance can cause motors to overheat and prematurely fail. If you are unsure of what capacitor is required for your unit, please call us at 734-326-3900. What are the symptoms of a ICP AC Blower Motor not working? Burning smell through vents. Humming and/or bearing noise. Breaker trips. Furnace turns off and does not restart. Motor is seized and cannot turn blower wheel by hand. 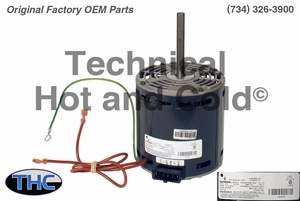 Technical Hot and Cold offers the ICP 1085588 Blower Motor OEM replacement part for sale online and over the phone. Call (734)326-3900 to speak with a technician for additional information on each ICP replacement part.